Museum Time is a series of guidebooks, recently made into a phone app, to the museums of Spain, with editions for Madrid, Barcelona, Seville, and the Basque Country. Museum Time is a series of guidebooks, recently made into a phone app, to the museums of Spain, written by art historian and international best-selling novelist Noah Charney. The first four guides in the series were published by geoPlaneta in 2010, and feature the museums of Madrid, Barcelona, Seville, and the Basque Country. 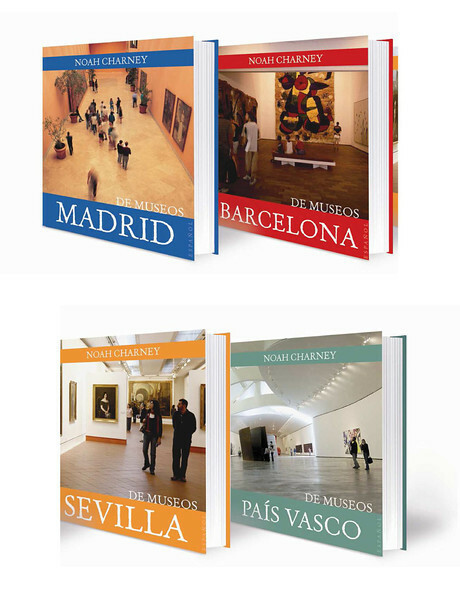 The guides are also available in Spanish, under the title of De Museos. These guidebooks contain private, personal guided tours of carefully selected artworks in each of the major art museums in cities included. Each artwork is presented with 1-2 pages of text. The information provided is not simply art history and random facts, as with most other guides. The guides are subjective, the personal opinion and ruminations of its author, including the necessary historical information and relevant anecdotes, but with a focus on answering the question: why should I travel to see this artwork? The selections in each museum are also subjective, not necessarily the most famous pieces. For each, the author argues in favor of the artwork being worth the journey, expanding beyond the dry facts to which most guidebooks cling. These books fill a gap in guidebooks, which tend to either just mention a few highlights in each museum, with almost no information about the artworks included, or which are exhaustive catalogues published by the museums themselves, with dozens of works (more than most tourists have patience for), and they cover only the one museum in question. These books attempt to fill this gap, offering readers a personal, entertaining, informative guided tour of all of the museums in the cities they visit in one stylish, concise package. The world's great museums hold wondrous treasures, but can sometimes be intimidating. With so much to discover, it can be daunting and somewhat dizzying: an embarrassment of riches for which some gentle guidance might be welcome. The objects themselves, while certainly beautiful, can often be enigmatic. These guides provide friendly, informed assistance in choosing which artworks to see in the greatest art museums of Spain, and also suggests how we might see these works: the peculiarities, inside stories, intriguing anecdotes, and broader lessons about history and art that we can glean from these masterpieces. This book provides a private guided tour, a portable art historian to accompany you on your visits to the museums, and a beautifully-illustrated souvenir to take home with you, as a reminder of your trip. Each museum in each guide is represented by a selection of artworks—ten works for the most important museums, and as few as one for smaller museums which have one “star attraction” in particular. Each work of art is presented in 1-3 pages of text (400-800 words), just enough to read while standing in front of the painting—much more information than is contained in normal guidebooks and on the wall copy of the museum, but not so much as to be overwhelming. Each guide contains 45-60 selected artworks, each one of which is accompanied by a high-quality color image of the work, so that the books can act both as a guide, in hand, while the reader visits the museums, and also as a souvenir of the visit. Practical information, such as a city map with the museums highlighted, the opening hours of museums, are also included, as are general introductions to the cities involved. The Museum Time series has met with significant acclaim, particularly in Spain and other Spanish-language nations, which comprise the primary target market for the publisher, geoPlaneta, an imprint of Spain’s largest publishing house company, Planeta. A book release event was held at Madrid’s Museo Thyssen-Bornemisza in March, 2010, and the director of the museum, Guillermo Solana, praised the series, saying that “Noah Charney represents an important bridge between museums and the general public.” The books are available throughout Spain, in bookstores, online, and museum shops, and the books are also available in selected locations outside of Spain.